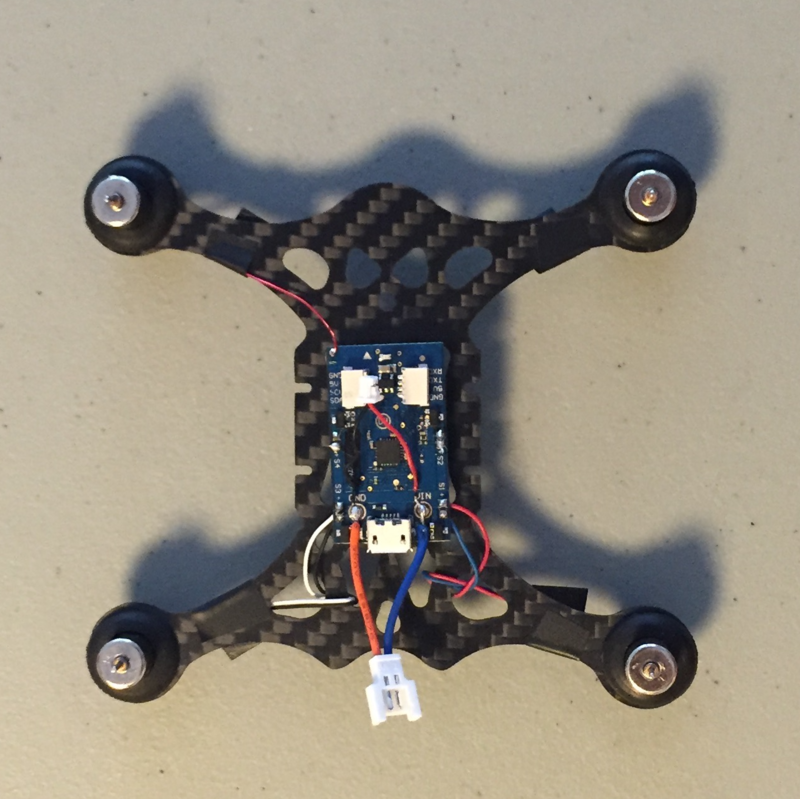 This post follows the post DRS120 Kit & Additional Components and describes the process for assembling the frame, installing the motors, flight controller, propellers, and FPV camera, as well as connecting the electronics. Once the complete list of parts is purchased and available, it is now time to assemble the quadrotor. The first step is to install the motors on the frame. Referencing the below image, insert each motor/protector pair into the rubber motor grommets. Note that the motors with the red and blue wires spin in the clockwise direction while the motors with the black and white wires spin in the counter-clockwise direction. Once the motors are installed, the frame should look similar to the image below. The next step is to mount the flight controller. This can be done using some double stick foam. 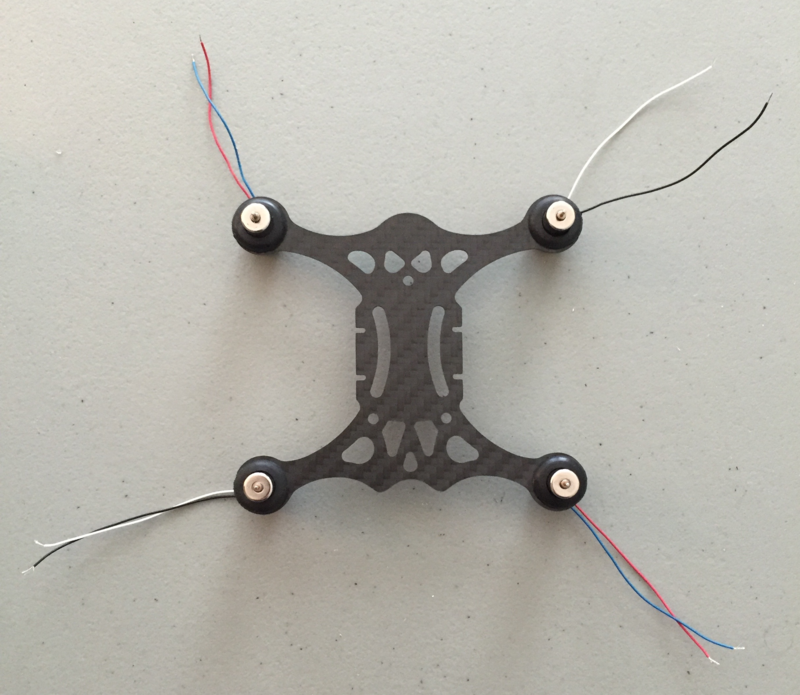 This helps reduce vibrations during flight to improve the performance of the quadrotor. Once the flight controller is installed, we can solder the electrical wires onto the board. 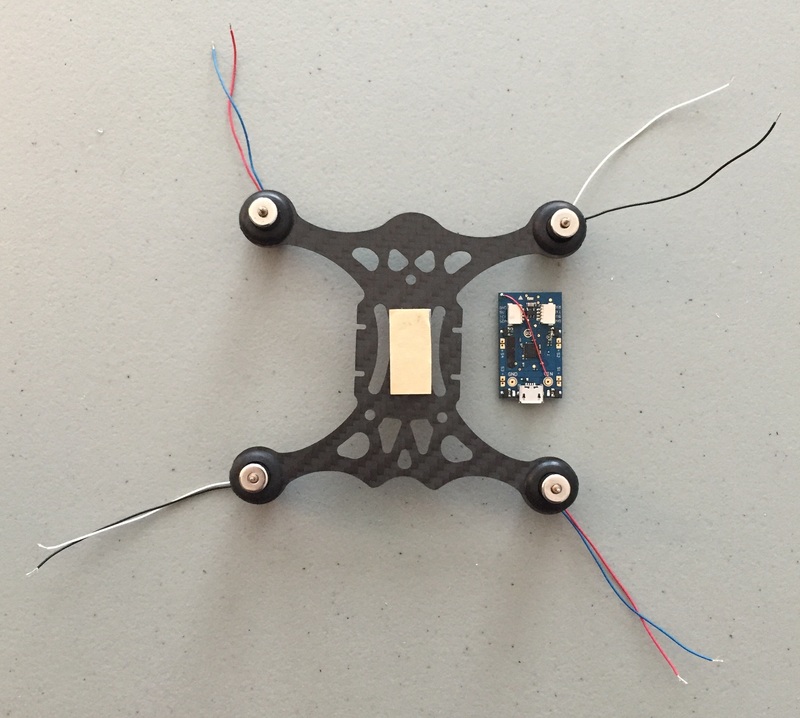 The quadrotor should now look similar to the image below with all of the wires soldered to the flight controller board. Next, use the 6mm M3 Nylon screws and 15mm M3 Nylon standoffs to install the top deck. The velcro on the top of the board will connect with velcro on the battery to help hold the battery in place. After the top deck is installed, install the propellers. 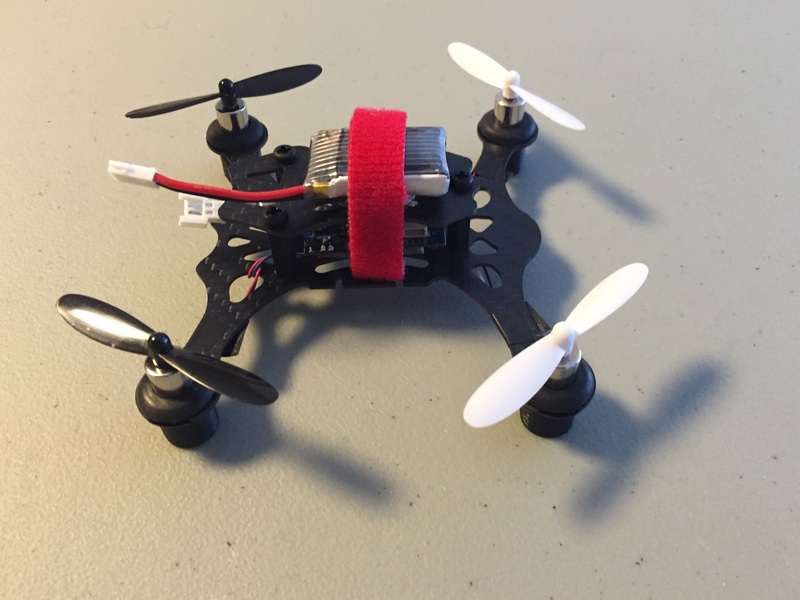 Alternating colors make it easier to determine the orientation of the quadrotor when flying it. Use the same orientation graphic from the motor installation to insure that the “A” labelled propellers are mounted onto the clockwise motors and the “B” labelled propellers are mounted onto the counter-clockwise motors. If you need to take the propellers off, a common kitchen fork is useful. The last step to getting the quadrotor ready for flight is to install the battery. The system should now look like the image below. The final step is to install the FPV camera at the front of the quadrotor. I used a small, 3D printed base to mount the FPV camera. Also note that it is helpful to install the camera at a slightly upward angle. This ensures the best view for the camera when the quadrotor is flying forward and slightly angled. 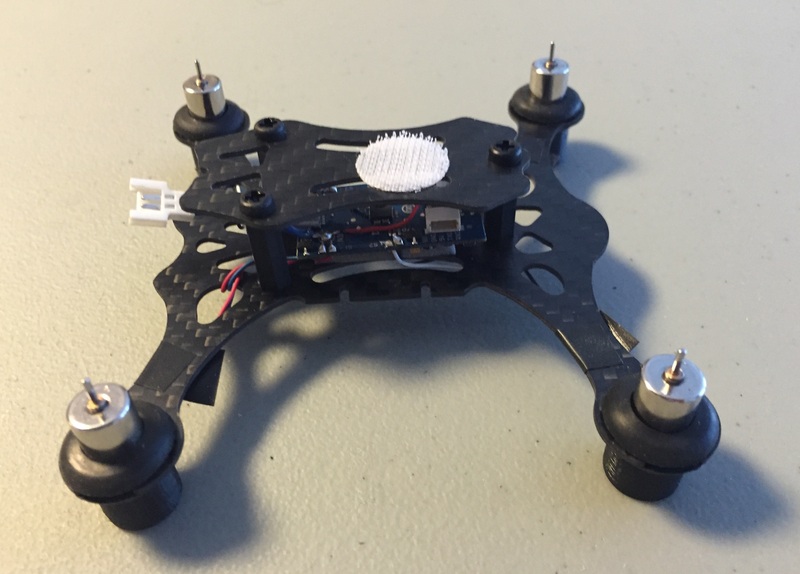 Hot glue can be used to attach the FPV camera to the base and the base to the quadrotor frame. The quadrotor should now be ready to fly and transmit video. The next sections will cover programming the flight controller board and calibrating the remote control.